Structural members that experience axial tensile loads need to be sized so that they do not deform or fail under those loads. Stress is the relationship of force over a unit area, and it allows for the comparison of material strengths independent of cross-sectional area. Every material has a theoretical ultimate strength and yield strength based on the properties of that material. 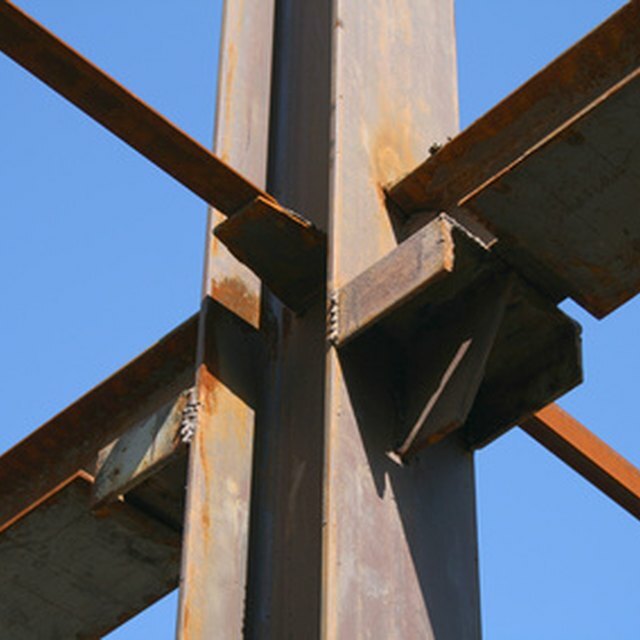 Therefore, if an engineer is designing a structural component, he can select the material and component dimensions based on the anticipated loads of the system. For a given component and a known tensile load, the maximum tensile stress is straightforward to calculate. For a member with a constant axial cross section, measure the cross section and calculate the cross-sectional area. For example, a member with a rectangular cross-section of 1 x 2 inches has a cross-sectional area of 2 square inches. A member with a circular diameter of 2 inches has a cross-sectional area of (1 inch x 1 inch x pi) 3.14 square inches. For a member with a variable cross section, select the smallest cross section. For example, a tapered cylinder will have the smallest cross section at the narrowest end of the taper. Divide the the applied load by the cross-sectional area to calculate the maximum tensile stress. For example, a member with a cross-sectional area of 2 in sq and an applied load of 1000 pounds has a maximum tensile stress of 500 pounds per square inch (psi). Susan Kristoff has been writing engineering content for 13 years. Her articles have appeared on eHow.com, Suite101, her personal websites, and the websites of many ghostwriting clients. Kristoff's expertise includes design, structures, sensors, data acquisition, and fabrication. Kristoff, Susan. "How to Calculate Maximum Tensile Stress." Sciencing, https://sciencing.com/calculate-maximum-tensile-stress-5905418.html. 13 March 2018.